Ever wondered what goes on when your back is turned? Wished you could be a fly on the wall in your own home without anyone knowing? Always fancied yourself as Daniel Craig’s successor? Well now all of this, and more, can be yours! Introducing the newest addition to Festive Lights, the Camdle…. 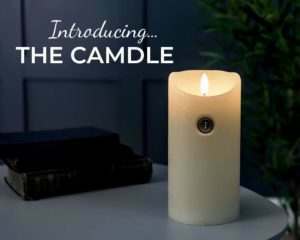 Our Camdle uses a miniature camera, cleverly disguised within an inconspicuous real wax candle, to keep an eye on your home while you’re not around. At festive Lights, we only offer the best and the Camdle is no exception. It boasts the cutting edge of spy technology, featuring brand new sensor technology previously only used by MI5. The concealed sensor not only picks up movement and sound, but also detects the slightest change in smell within a room, meaning it can quickly detect an unfamiliar presence – now you have a candle that smells you! The miniature camera films in full HD, both day and night, using infrared technology to create the clearest picture in all conditions. The 1 terabyte memory card can hold up to a huge 3 seconds of film at a time. The flame uses the newest in flickering disguise technology, scientifically proven to be undetectable to the human eye, so your suspects will never know they are being spied on. We know you all love our battery-operated candles, so we knew they would be the perfect cover for our new hidden camera! And it can all be yours for just £9.99! Sign up to our newsletter to hear how you can get your hands on the first batch of the Camdle.